VoIP Phone for $19.99? What? On Buy.com I came across a VoIP phone listed for $19.99. The product description catches my eye because it says "VoIP/Skype Desktop IP Phone w/Digital Answering System - Use Your Internet Connection to Make Calls! - PH210-PB". So it's a Skype VoIP phone with a digital answering machine. Intriguing. I decide to check out the rest of the specifications. I'm curious if this is also a SIP phone. Buy.com says it supports the H.323 v2 protocol. H.323? How ancient! I scan for SIP, but no mention of it. I'm beginning to wonder if that explains how this product is only $19.99. Still no mention of SIP in the specs. In fact, no mention of Skype. Huh? Skype doesn't use the H.323 protocol and who still sells H.323 phones anyway? Could just be someone trying to offload some old inventory. It's possible this is a standalone Skype phone that has the Skype software embedded, which would be a cool product, but I'm a bit skeptical. 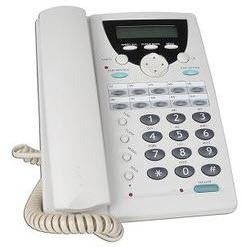 Would certainly be pretty cool to have an Ethernet Skype phone with built-in digital answering machine, but information is very scarce online about this product. In fact, Buy.com says the item is currently unavailable and out of stock. Geeks.com is still selling them, but I'm not sure I want to gamble $19.99 + S&H on some unknown product that may or may not have Skype functionality. Do we have any takers out there? If so, let me know how it goes in the comments. Feedback for VoIP Phone for $19.99? What? this guy selling it on ebay seems to be linking to a skype to sip pdf from skype.com in the product description. So that is probably how it links up. Yeah, the eBay listing says it refers to Skype for SIP. Well, that doesn't make this a Skype phone any more than my desktop SIP phone is a Skype phone. Pretty lame to call it a Skype phone. But it does support SIP, and for that reason this does become an intriguing phone. Most decent SIP phones are >$150, so for this to be this cheap is pretty amazing. That's cool,But why they are giving at such nominal rate is the sales of the product is not good or this is some promotional sort of thing? ?,,,i remeber one of my friend purchased it at $60. How does your friend like it? How's the voice quality? Does he/she like the digital answering machine feature. Kind of unique for a SIP phone. See if you can get his/her insights. Much appreciated! It neither supports Skype nor SIP. H.323 only. So it is not really useful. You can use it as a regular desktop phone on a POTS line, but no CID support. And to dial out you need to dial *0 prefix. No speaker phone! I bought it from Geeks.com via buy.com. When I called and pointed out that the description on buy.com was misleading, they ask me want a refund or store credit. They don't even want the item back! Never pay for telephone services again! I forgot to tell You about DVoice Referral Program. For every customer you refer to DVoice a month reoccurring credit will be applied to your account. When your monthly credits are equal to your month telephone bill your service is FREE! If your monthly reoccurring credit exceeds your monthly bill, DVoice will write you a check for the additional credits! Thanks to Dvoce Referral Program my phone service is free now. See this link How I did it. I got three phones from geeks.com and they are clueless. they told me to ask my provider and I said the provider will not bother helping hundreds of customers on every single ip phone there is. it says so on their web site. I told them I would keep them if they told me what phone provider offers service for this phone.they do not have time to play with the phone so they offer a refund.it seems they hope to sell them and do not care if you really can use them.after many hours of trying I could only make peer to peer calls on my lan network with two of these phones but I wanted them to work on the internet like the add claims they do.do not buy repeat do not buy.I told them about the bad review on phone and the geeks web site was mentioned. Can anyone recommend a Skype / sip phone compatible w/Puppy or Xubuntu? It works fine on Win2000 so I run it on a dedicated P3 I got out of the trash. If someone makes a Linux device/service comparable I will switch.